1.) What makes you different from other event companies out there? 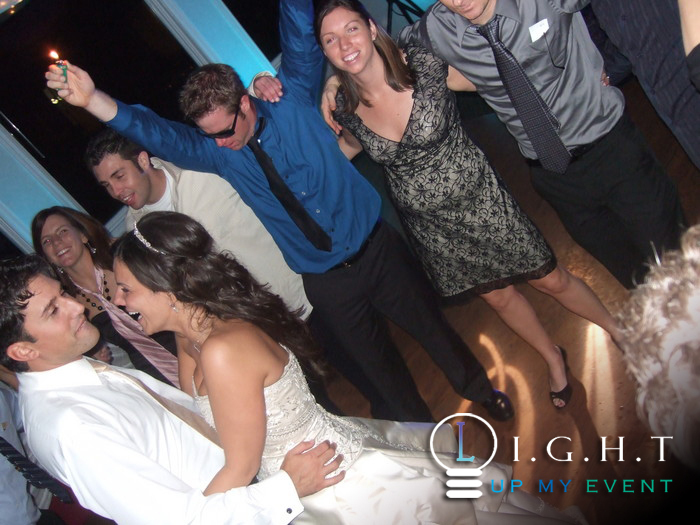 What makes us different from other DJ companies in Michigan is that we pay close attention to your reception timeline. We are certified from the Florida Academy of Mobile Entertainers specializing in DJ entertainment. We are responsible for the success of hundreds of receptions every year, which accounts for over 80% of our business. We have years of experience with unique wedding receptions, and every weekend we face another challenge, “To deliver a personalized event”. Our style is based on your expectations, and we will easily coordinate your event with the client login. We work with other vendors so that they do an excellent job for you. Our DJs manage the announcements and music so that it is presented at the right time and volume. Also since this company is part of Encore Event Group, you can bundle elegant wedding lighting or a Michigan photo booth with your package to receive huge discounts. We were the first company in Michigan to become F.A.M.E. certified. 2.) Are you licensed and insured? Yes, as a legitimate LLC event service company, we are covered under a $1,000,000.00 insurance policy. This is necessary to protect both you and your guests. Many venues are now requiring all vendors to show proof of insurance so you may want to ask your DJ for a copy of their valid certificate of insurance. 3.) Do you use professional equipment? We invest thousands into top of the line gear on a regular basis. You won’t hear us talking about wattage /amps like other companies out there. We are more focused on explaining the value in services you will receive. To answer your question, every system is outfitted with crystal clear microphones, audio technology, computer controlled LED configs, handcrafted photo booths, & backup equipment. 4.) What will be your attire for my reception? Our entertainers always wear company attire that consists of a black suit, black shirt, name tag, and platinum tie for formal events. However, attire can be more casual if your event is informal or you request it in advance. Typical casual attire is a black company polo. 5.) Will you take requests for my wedding? Definitely! Once you book with us, you are given a password. You can drag and drop all your favorite songs off the website. You have complete control over music for your big day. We will guarantee to have any song you want before your wedding. We only require that it is commercially available in print in the U.S.
We will also give you as many Pick n Play cards you need (1 per couple). You can mail these out with your invites. These cards have a password so guest can requests songs online, months before your reception. We also take guests request from your event. This is one of the most important things an entertainer can do. This establishes rapport with your audience so that the guests can feel comfortable with making requests. Bottom line: we play the right music, at the right time, at the right volume. 6.) What are your prices? Pricing for a standard DJ package starts at $165 per/hr for a 6 hour package. This magic number becomes smaller as you bundle on wall lighting and photo booths. We are very flexible and deal with hundreds of budgets every year. Our goal is to not over quote you, so please contact us at 877.643.8368 for an exact price quote. 7.) Can you help with coordinating our reception? Yes, we would love to answer any questions you might have. Our goal is to remove the stress of planning a reception. We understand this is probably your first, and hopefully last time that you are planning a wedding. We have tons of recommendations and tips to help make wedding planning a breeze. We are a full-time company, which means you receive our undivided attention. Our online planners assist you with your grand entrance, itinerary/time line, formal dances, and song request list. It is laid out in a easy to understand format, so it takes minutes to organize the evening. We can take things out or put things in. Expect a phone call from us a week for your big day to go over all these details with you. If you have any questions in the mean time, help is only a phone call/e-mail/smoke-signal away. There is only one way to plan a wedding reception and that is your way. 8.) How far are you willing to travel? We are based in Rockwood Michigan, which is 15 minutes south of Detroit. However, Encore Wedding DJs has done receptions over the entire State of Michigan. We have gone as far west as downtown Saugatuck and as far north as beautiful Mackinac Island. We are willing to travel _____________ miles away for your reception. Feel free to fill in the blank. 9.) Can I meet with you and see you perform? We always look forward to meeting with clients in person prior to signing their contracts. This gives us a great opportunity to get to know you a little better and understand exactly what you are looking for. In regards to seeing us perform at other shows, we do not allow people to attend private events closed to the public. We like to focus all our attention on the client booked for the day, and not the next one in line. We feel it can be be rude to our existing clients and our dedicated time to them can be distracted. The last thing we would want you to think is if we are performing for someone else. Instead, we would like to encourage you to view Encore Wedding DJs client reviews. You can also view our GlamCam photos to see recent receptions in action. If a DJ company offers to have you visit someone else’s wedding reception then there is a very good chance they will invite strangers to your special occasion as well. Try to meet with them at their company location. If they don’t have a studio, then you might feel more comfortable meeting at your actual venue.